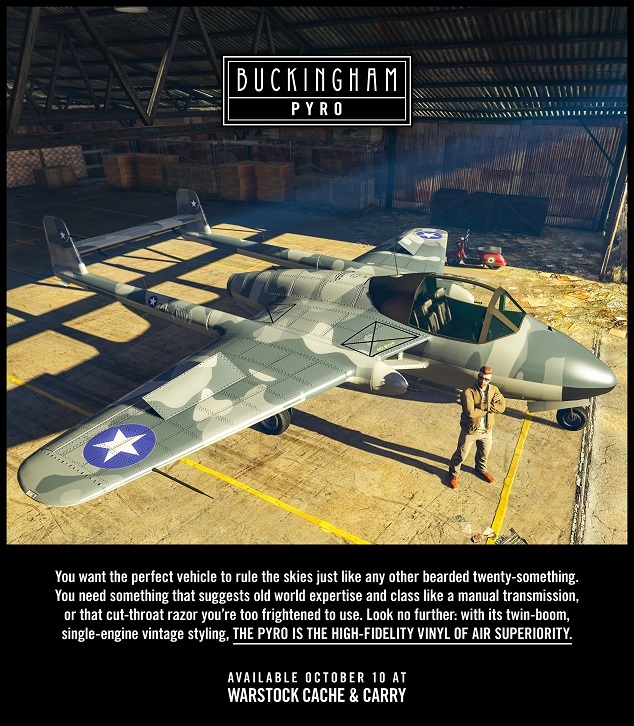 The Buckingham Pyro is available today from Warstock Cache & Carry. The distinct twin-boom body comes packed with a jet engine and dual machine guns. Customize in your Hangar’s Workshop with homing missiles, liveries, armor, engine and handling upgrades, and more. Through October 16th you'll have ample opportunity to rack up your in-game cash and rep. Take advantage of extended Double GTA$ & RP in the jet-fueled, Capture-inspired Stockpile, the most recent Adversary Mode to land in GTA Online. And speaking of landing, parachute your way into the desolate warzone that is Motor Wars, also doling out Double GTA$ & RP this week. Plus, Bunker Research and Manufacturing and Biker Business Production will be running 25% faster, giving you more bang for your buck as you trade your way to the top. If you're looking to get in on some smuggling or gunrunning action, whip out your iFruit and head to the Maze Bank Foreclosures website, where you'll find 25% off the Fort Zancudo Hangar 3499 and the Thomson Scrapyard Bunker. There's also a meaty 25% off all Bunker Renovations, now through October 16th. • Time Trial - "Raton Canyon"
Hit up the GTA V forums!